Offering a stable start-up environment and support for energy, food and agricultural businesses – could the East Anglian city be right for your start-up? Why start a business in Norwich? The capital of England’s vast rural East Anglia region, Norwich will provide a good home for businesses in the energy, food and agriculture sectors although support for businesses in other mainstream industries is fairly limited. Both traditional and green energy businesses are well supported through a variety of schemes, with many based in the East of England Energy Zone – the gateway to lucrative gas reserves in the southern North Sea and a thriving offshore wind cluster. Norwich and its surrounding counties have always been closely associated with agriculture, and it is one of the last regions in the UK in which this industry still thrives – the food, drink and agriculture sector is estimated to contribute some £2.2bn to the regional economy. Numerous support and growth initiatives are available to help businesses in the farming and food sectors, which we have outlined in more detail below. There is also a small but burgeoning tech scene, networks such as SyncNorwich are striving to build a thriving technology community while TechEast is in the midst of a four-year campaign to boost Norwich’s digital economy. However, there is no getting away from the fact that Norwich is a fairly remote place. It is the only major city in the region and London is almost three hours’ drive along the A11 motorway, which connects Norwich with London and the South East. Norwich International Airport is a short drive from the city centre, but almost all of the international destinations it serves are via Amsterdam – not ideal if you are a business that relies heavily on international trade. The University of East Anglia is the region’s major higher education institution and is very well regarded amongst students and employers alike. Whilst it’s dropped slightly in The Guardian’s university league table to 20th for 2016, an impressive 71% of graduates find employment after six months of graduating. As well as being a good source of local talent, the university offers a range of support services and benefits for local businesses, which include funding opportunities, recruitment, CPD and training, and business partnerships. Businesses looking for creative or artistic talent also have the students of Norwich University of the Arts to draw on. This well-regarded arts school offers courses in subjects such as graphic design, illustration, photography and fashion. Overall, Norwich has a fairly educated population, with over a third of the workforce (39.3%) holding NVQ Level 4 qualifications or above. This is comparable to cities such as Manchester (39.5%) and Canterbury (39.3%). Recruitment costs are lower than average, with weekly wages currently standing at an average of £460 per week. Most support for Norwich-based businesses can be found via the New Anglia Local Enterprise Partnership for Norfolk and Suffolk, which champions the region’s reputation for life sciences, energy, food and agriculture businesses. The New Anglia LEP website can direct businesses to a range of support and funding opportunities. Support is set to increase too, following the chancellor’s Autumn Statement last month, it was announced that New Anglia has secured one of the government’s new enterprise zone sites across Norfolk and Suffolk. 10 locations have been awarded enterprise zone status, including Norwich Research Park which helps to spin out health, plant and food businesses. Support for energy businesses is currently centred around the East of England Energy Zone, based at the nearby ports of Great Yarmouth and Lowestoft. The region is set for £50bn capital expenditure over the next 20 years as the enterprise zone’s creators look to cement East Anglia as a world leader in both the old and new energy sectors. Plans to double the size of the existing enterprise zone were also approved in last year’s Autumn Statement creating space for an additional 30 businesses. Development land and office or industrial premises are available for sector businesses – with gas resources in the Southern North Sea predicted to last another 30 years, there is still time for businesses to exploit the region’s natural resources. As with other UK enterprise zones, incentives for businesses looking to relocate include simplified planning, superfast broadband, and business rate discounts that could eventually be worth £275,000. Tech businesses are also in good company; earlier this year – 2017 – it was announced that Norwich would have its very own tech accelerator programme. Ran in partnership with Barclays, the TechVelocity accelerator intends to act as a beacon for “the region’s best digital talent”. Science is another sector strong point for East Anglia, with most support found at the Norwich Research Park complex. The community combines world-leading science research organisations with over 40 science and technology based businesses. Managed by Norwich Research Partners LLP, the park houses over 12,000 people with a combined annual research spend of £100m. The 230-hectare park claims to have one of Europe’s largest single-site concentrations of research in the agri-food, health and environmental sciences sectors. It aims to connect businesses in these sectors with cutting-edge research performed by the 3,000 or so scientists and senior clinicians on site. The different sites within the park have combined their resources into a single virtual technology centre which can be viewed here. For business support in other sectors, the Norwich council website provides a full list of the schemes and information currently available. Initiatives include Enterprise Norfolk, which offers free workshops to support those looking to start an online business, and the Norwich Enterprise Centre, which describes itself as a physical and virtual “one-stop shop” providing information and support to entrepreneurs, start-ups and local businesses with “growth ambitions”. Businesses looking for Grade A office stock should consider the Broadlands Business Park; situated next to the A47 on the eastern side of Norwich, existing tenants include high-profile names such as Aviva, RBS and NHS Norfolk. For retail start-ups, Norwich Market is a major covered market in the city centre with around 200 stalls selling a range of items from food to children’s toys. You can apply to become a market trader using the application form found here – expect to pay anything from £185 to £500 per month depending on the location and the type of goods you plan to sell. For a city with a relatively small population, Norwich is well served for grants and funding. Agriculture business can benefit from the Eastern Agri-Tech Growth Initiative, a £2.5m programme designed to support improvements in agricultural productivity. The scheme is split across two separate funds – the first of these, the Agri-Tech Growth Fund, provides amounts of between £10,000 and £150,000 to businesses with projects intended to improve agricultural productivity. The scheme’s £540,000 R&D Prototyping Fund has a more general focus and offers smaller amounts of between £10,000 and £60,000 to support the development of innovative technology. 29 grant applications have been approved so far. Start-ups in other sectors can look to the regional Grants4Growth programme for support. The scheme provides small and medium-sized enterprises (less than 250 staff and £50m turnover) with capital grants of up to 28% of the cost of a project. Eligible projects should make businesses more efficient, invest in technology, or invest in green processes. There is also support available through the Growing Business Fund & Small Grant Scheme, which offers between £500 and £500,000 to support up to 20% of the cost of projects – although you must secure match funding from private sources to qualify for support. Elsewhere, Grants4Growth’s EnergyGrant500+ scheme is intended to help small and medium-sized businesses purchase and install energy-efficient equipment, such as low-energy lighting. Grants of £500 to £2,500 are available through the initiative. Non-grant funding for green businesses is available from the Low Carbon Innovation Fund, which supports businesses in the region which contribute to the low-carbon economy. Equity investments of up to £750,000 are available to support up to 50% of the costs of a project. Despite this extensive range of support, Norwich does not currently have an active angel investor network – New Anglia Capital Ltd appears to be attempting to drum up support from investors but is not active currently. Norwich and the surrounding area have proved to be a remarkably stable environment for start-ups, as opposed to the more volatile conditions found in bigger cities. 535 businesses closed down in 2015 – the third lowest rate in the UK, just behind Oxford (480) and Cambridge (490). Norwich’s relative remoteness has contributed to a different, more laid-back atmosphere than other cities in the UK. 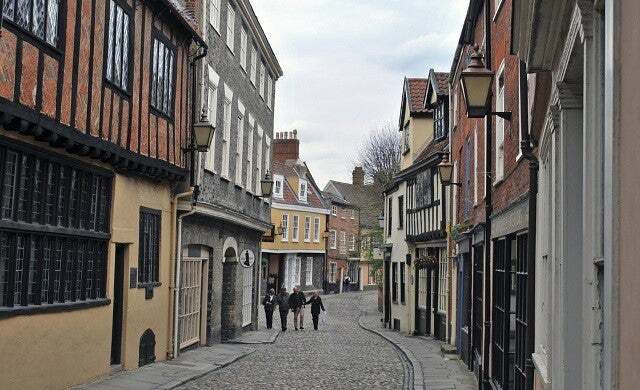 As England’s second city from the medieval days through to the Industrial Revolution, Norwich boasts an impressive array of heritage landmarks, including the stately homes of Surrey House and Assembly House, the Industrial Revolution-era St James’ Mill, and the spectacular Norwich Cathedral. The city’s strong agricultural tradition means that residents have enviable access to excellent local produce, much of which is sold at Norwich Market through the week and on Saturdays. This heritage is also celebrated at the annual Norwich Food & Drink Festival, a two-month programme of food experiences, debates and activities taking place from August to October. It is the largest such event of its kind in Europe. House prices are somewhat below the national average, standing at an affordable £196,987. Crime rates are around average for a city of its size although they have increased fairly considerably in comparison with last year – its 94.67 crimes per 1,000 population statistic is now more than Leicester and Liverpool but still stacks up favourably against the higher rates of Nottingham and Manchester. A first-hand account from an early-stage start-up on what it’s like to start a business in Norwich and what the city has to offer new entrepreneurs. You can also gauge insider opinion on what more Norwich needs to do to accommodate start-ups. Delighted to see you featuring Norwich. We have a number of really strong and supportive business networks, which might explain the low failure rate for start-ups. It’s also worth pointing out that the city is only 2 hours from London by train and the airport gives us some of the fastest international links of any city in the UK. And yes, the heritage and quality of life is great but we are not a sleepy backwater. The “Industrial Revolution-era St James’ Mill” you mention is now home WhiteSpace, the Norwich tech hub, which provides co-working space for numerous start-ups. You are welcome to join the conversation with the local innovation and digital creative community on twitter @HSNorwich.